Amid the new surroundings, the on-table action provided plenty of Derby City classic stories, headlined by the performance of John Brumback, a part-time player and full-time farmer, who rode a victory in the banks division to win the $20,000 Master of the Table. The first chapter of his Cinderella story was not completely unforeseen. 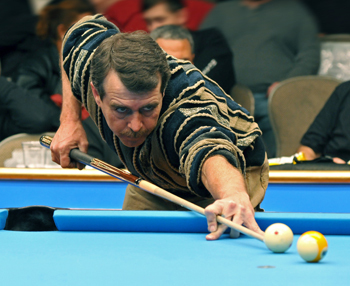 After all, Brumback has been runner-up in the 9-ball banks division twice before, falling in the final in both 2003 and 2004. Even this year the 45-year-old resident of nearby Owenton, Ky., faced an uphill battle in the later rounds, thanks to the Derby-only redraw process that randomly matches remaining players on a round-by-round basis. When the nearly 400-player field was pared down to just three, Brumback drew Johnathan Pinegar, while the undefeated Rodolfo Luat received a bye into the final. Brumback earned a hard-fought 3-2 win over Pinegar, advancing to his third appearance in the banks final in seven years. Luat, though, still held his buy back, meaning Brumback would have to beat the Filipino in two straight sets to earn his first title. Under the heavy lights above the main table in the Accu-Stats arena, Brumback took the first set, 3-2. With a fidgety tableside manner, Brumback addressed then readdressed shots, pushing his sweater sleeves above his elbows before finally settling into position. With Luat on one loss, it was one set for the title, and Brumback knew he had a mental advantage after dominating Luat, 5-1, in the first set's case game. "I felt like if I won that first one that I was going to beat him," he said. "If I just got the first one, he wasn't going to play quite as good in the second, and that's what happened." Deep in the heart of bank pool country, with a local shooter just three racks from snapping off the $10,000 title, the crowd was decidedly pro-Brumback. Eliciting hoots and hollers from the stands, he won two of the first three games to get on the hill. He took an early 4-1 lead in the fourth game, forcing Luat to go on the offensive. After a risky table-length attempt, the Filipino left Brumback an easy cross-corner bank on the 9 ball for the title. He drilled it, dropping his cue on the table in disbelief. "I wanted that more than anything," Brumback said after his win 11 years in the making. While lacking a bit in experience on the big stage, he was raised on banks, taking his lumps from players like Nick Varner, Buddy Hall and Gary Spaeth. But now the soft-spoken farmer from northern Kentucky won the big one, and he knew it was no easy task. "I didn't know if I'd ever win it," Brumback said. "I didn't know if I'd ever make it back to the finals, because it's so hard to get all the way through there. This is the biggest thing that's happened to me, for sure"
He didn't know it at the time, but Brumback was in store for bigger things. He finished 10th in the one-pocket division. After John Schmidt captured the one-pocket crown, Brumback held a lead in overall points, collecting 147.5 while Pinegar stood in second with 130.